The local police have an easy suspect - Barry. Determined to prove quirky Barry innocent of murder, Fred puts on her detective hat, and with Watson by her side, she explores her new town and gets acquainted with her fellow shopkeepers. Could one of her friendly neighbors be the real culprit? And what would be the motive for killing the owner of the Sinful Bites candy store? The secrets Fred discovers put her at odds with the local police sergeant and threaten her cozy future in Estes. Story is good and wasn’t too long. Nice characters that are likable. Perfect light mystery to pass an afternoon. Overall I enjoyed it very much. This audiobook was given to me at no charge. This review is my own and was not required. I have only become a mystery fan in the last three years but I am a fan of this author's books under a different name. So I definitely wanted to check out Mildred's cozy mysteries. This is the first time I've listened to this narrator and I thought she did very well. She is good at providing different voices for the characters and has a pleasant voice. I really like the character of Fred. First I love her name, I always thought girls with boys names (shortened from Winifred) were cool. She is your average woman. She has been through some tough times as well as good. She doesn't bemoan her life though. She just chalks it up to experience and moves on. Her description makes her sound like she's not particularly skinny while not being really overweight. She seems comfortable in her own skin and I like that. She is definitely someone I felt like I could relate to. The secondary characters are great and well written too. Fred just moved to the town that her mother and stepfather live in. They are a little eccentric and absent minded but are supportive and loving, too. I thought they were likable as well as her two gay uncles who own a shop in town, too. There is a baker who seems like she might become friends with Fred, a police officer that hates her and another that seems a little interested in her. It is an interesting little town for sure. Fred's dog, Watson, is also an important character in the series. The bookshop is going to be called The Cozy Corgi and the book series has the same name. I have never had a pet so I'm not a real big animal person. (I feel like I should be embarrassed about that.) I don't always think to mention pets in book reviews but in this series Watson is relevant. Fred talks to him and probably considers him a partner of sorts. Most people can't help but love the dog and if you have a treat in your hand, he might just like you back. I think as the story goes on he will remain pivotal. The mystery in this book was interesting. After just about a day in her new home and business, Fred finds her shop neighbor murdered in the upper level of her own store. Immediately I had my suspicions of who did it, even though I had just met these characters, myself. Fred's late dad was a detective and with her stepfather being a suspect, she begins to investigate. There was a time or two where my original suspicion faltered and I wondered about what was happening especially when another murder takes place in a nearby town. And though, my original guess of whodunnit was correct, I liked seeing Fred work through the investigating and finding out the motive/reason for the murder. There seems to be a few persons of interest in terms of Fred's love life and I look forward to seeing her caring and quirky family again. It was an enjoyable story and a great beginning to the series. I can't wait to read or listen to more of them. This is a quick and entertaining cozy mystery. The characters and story are engaging and the pace of the story is quick. I enjoyed this book and look forward to the next one. First, I love this series. So much so, that I’m now re-reading them by listening to them! No matter if you have read them or not, having them read to you will be fun. 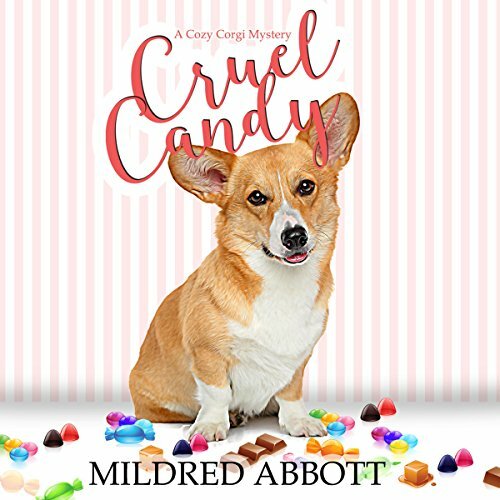 The characters will be ones you want to get to know, amidst a few murders, with a lovable Corgi, and delicious baked goods. If Cozy is your genre, the Cozy Corgi is your series! I loved hearing about Winifred and Watson. I really like that Winifred wants to prove that Barry is innocent. It is really cute that Watson gets to help out with the case. This is a really great sweet read. Just about the entire time I listened to this story I had a smile on my face because of how relaxing I found listening to this story. Angie did an amazing job narrating and she really helped give this story that cozy happy feeling. This is different from my usual reads and I had fun listening to it. I'm all for cute and entertaining, and this certainly fit the bill. The murder mystery was a little bizarre. Why would the killer wait till now to do what they did? They had all those years to kill, and then decided to do it where the murder would be discovered. I liked the characters though. They were well done and, aside from Fred (and others) focusing on her height (5'10" isn't that weird folks), I thought they were realistic. I am a cat lover myself and can say dogs are cute (small ones) from a distance but I would never want one in my home OR place of business, especially a place that sells food. That didn't strike me as realistic but I just went with it. Fred as a amateur sleuth worked for me, and I did enjoy hearing her commentary with Watson about finding clues and his obsession with treats. As for the narration, it was good. I don't listen to a lot of female narrators and was worried about that, but Angie Hickman has a good voice and I thought it was very well suited to this story. The audio could have benefited from a male narrator to handle the step-father and cute cop, but Angie handled the male voices well. I would (and am) listen to Angie Hickman again. I give the story 3 stars and the narration 3.75. First in a series, went right on to the next one. This was the first in a series of a new cozy mystery to me. I flew through the first one and went right on to the second. I enjoyed the pace, the characters, the setting, and the fact that there was a dog featured in it. I mostly listen when I'm knitting or in the car and looked forward to returning to it whenever I could. I was given this free review copy audio book at my request and have voluntarily left this review. This was a fun cozy mystery.When Fred and her dog check out her new shop,they find a body.Who killed the most unliked woman in town?I won't tell you.I enjoyed listening to Angie Hickman narrate this one.I was given this book by the narrator,author or publisher free for an honest review. This was an extremely good cozy mystery. There was a great min of, mystery, suspense, murder and romance. The narrator does a great job of bringing the characters to life. This was my first Mildred Abbott's book. This is the first book in the Cozi Corgi Mysteries. This story is well written, funny and entertaining, filled with mysteries. I love the two main characters Fred (Winifred) and Watson. I also love the secondary characters. The narration is great and easy to listen. Angie Hickman has a soft and beautiful voice. I enjoyed my listening. I'm looking forward for the next book in the Series. I received this free review copy audiobook at my request and I have voluntarily left this review.